Greece and Serbia signed agreements on energy, transport, networks and tourism within the framework of the 1st High-Level Cooperation Council on Thursday, in Thessaloniki. Tsipras underlined the upgrade of the strategic cooperation between the two countries in a critical period of time for the future of the wider region. “There are new prospects and there is need to better coordinate our region at an international level,” he said. It is rather important that the Greek-Serbian High-Level Cooperation Council is held in Thessaloniki, Tsipras noted, as the city has become a hub and diplomatic center of inter-Balkan cooperation. The prime minister referred to Greece’s role as one of the three most important investors in Serbia and announced the interconnection of the two countries via the Piraeus – Thessaloniki – Belgrade railway. The prime minister also underlined the cooperation with TAP, IGB and IBS pipelines, as well as the strengthening of cooperation on tourism. Moreover, Tsipras announced the signing of memorandum of understanding on cultural cooperation as well as the upgrade of political dialogue and military cooperation at an educational level. The agreements signed also included the strengthening of cooperation on terrorism, trafficking and migration. The Greek prime minister stressed that Greece is a key pillar of stability in south-eastern Europe and cited Greece’s positive economic performance. Finally, Tsipras announced that at the invitation of Aleksandar Vucic, the President of the Hellenic Republic, Prokopios Pavlopoulos, will visit Belgrade next autumn. 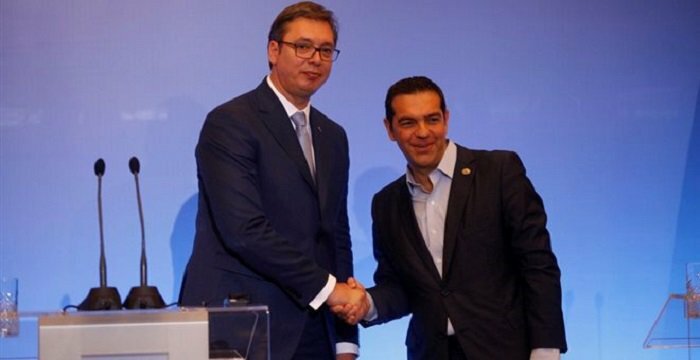 On his part, Serbian President Aleksandar Vucic expressed his content that Greece supports Serbia’s European prospect. The Serbian President stressed the need to boost the Greek-Serbian trade and promote Serbian investments in Greece and Greek investments in Serbia. He also congratulated the Greek prime minister for the good economic performance and the fact that Greece stands again on its own feet.